Thor: Ragnarok will be as much of a Hulk movie as Captain America: Civil War is an Avengers movie, so it shouldn't come as a huge shock that we're no closer to the green goliath getting his own solo adventure then we were when the original Marvel's The Avengers came out in 2012. Backing up statements he made earlier in the year, star Mark Ruffalo tells fans that a Hulk movie is further away than it's ever been. And the reason is the same. Universal owns the distribution rights. But we shouldn't focus on the negative. Bruce Banner and his emerald alter ego are going to be a big part of Thor 3. So much so, you could include his name in the title if it didn't already have such an iconic one to begin with. As we heard when it was first announced, Thor: Ragnarok is going to be a cosmic road trip. Mark Ruffalo describes Bruce's pairing with the Norse God as a very odd couple. And it will be very funny. "I don't know what the story is yet, but it'll be [Loki] and Thor, and then I'll be in there here and there. But I don't know any of the particulars yet...Chris [Hemsworth] and I have a really good time together, we goof off and play around when Tom Hiddleston is around. So it'll be a lot of funny back-and-forth...It'll have that kind of antagonistic 'Odd Couple'-thing going on." Basically, Marvel can't call it a Hulk and Thor movie because Universal holds the rights to distribute anything held under the Hulk title. 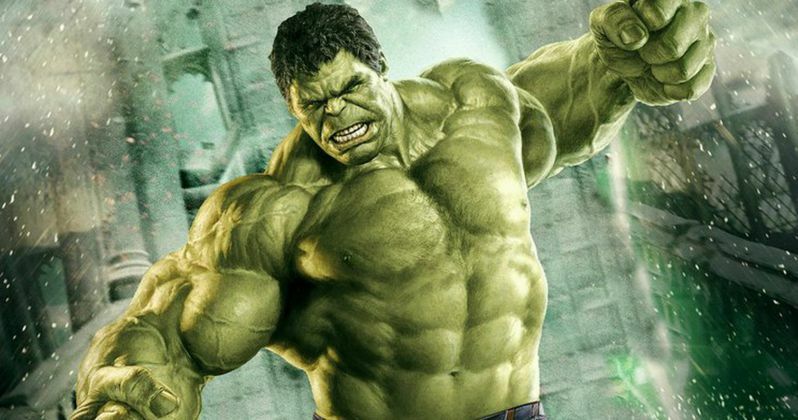 There have been strong hints that this next Marvel Phase Three sequel will incorporate elements from Planet Hulk, but that has not been confirmed by anyone associated with the movie. About why we're still so far away from an actually Bruce Banner solo adventure, the actor had this to say while chatting with USA Today. "Actually, it feels even further away. It's not Marvel's property, it's Universal's property. I don't know. It seems really problematic. I've been around long enough to be OK with it. There's only so much that's in my power and I'm not going to agonize over what is not in my power... I'd love to do it, it'd be really fun. There's a lot still to do with the character. I always try to think about different places we could go with him." The actor recently stated that he wants to see Bruce Banner separate from the Hulk, with the two going toe-to-toe on the big screen. It happened in the comics. The scientist even climbed into a retrofitted Hulkbuster to battle his burly alter ego, and win. But Mark Ruffalo wants to reiterate that this isn't for sure happening in Thor: Ragnarok. It's just on his wish list of things he'd like to see happen. He explains. "I'm angling for it. I don't know if it'll happen now, but at some point I'd like to see it happen. When I was doing 'Age of Ultron' - doing the Scarlet Witch acid trip scenes - it really took me a long time to figure out what the Hulk would be afraid of. And then I realized, it was Banner. That relationship is what we're all so into, but we've never seen them in the same scene together... I always imagined that that could be pretty exciting if we could pull it off." There are three other Marvel Phase 3 movies that we'll see before Thor and Hulk team up for Ragnarok. Captain America: Civil War shot all through this past summer and will be in theaters this May. The first trailer is rumored to arrive with Star Wars: The Force Awakens in December. Doctor Strange will begin shooting before the year is out. It will arrive in theaters November 2016. And then Guardians of the Galaxy Vol. 2 will open in the summer of 2017. Thor: Ragnarok is directed by Taika Waititi, who was hired to punch up the humor in the movie. Tom Hiddleston is expected to return as Loki, and the movie may even mark the first appearance of Valkyrie. While we're still a few years away, it sounds like this is going to be epic.